We are beginning to expand. 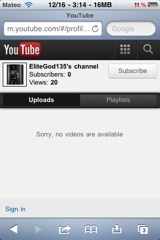 - Elitegod135 Youtube for MW3 Videos. - IOS Application Soon Pushing to Cydia. I take suggestions. Please comment with some feedback.